The City of Des Moines teamed up with Trees Forever and TreePans on Sunday October 15th 2017 to plant 26.2 trees along the IMT Des Moines Marathon route. What is necessary to run a marathon? We often forget about that last bullet, oxygen. 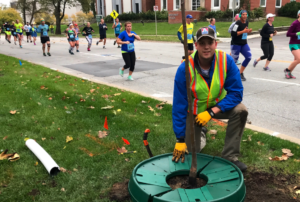 When we were approached to participate in this tree planting we were encouraged to “help provide oxygen for the runners of the Des Moines marathon!” What a neat way to view tree planting – providing oxygen for others to enjoy life! We were fortunate to be able to partner with the city of Des Moines and Trees Forever to plant trees in such a fun and exciting way. When we were approached about participating in a marathon to bring awareness to tree planting, most of our team was terrified that we were going to be asked to RUN 26.2 miles….. Instead, we lead volunteers and raced the runners to the finish line. Planting 26.2 trees along the route of the marathon route. It was a cold morning for the Des Moines Marathon, but with shovels in hand volunteers warmed up quick at 6 different planting sites digging holes to become homes for 26.2 trees. After the holes were dug, trees planted, and backfilled… volunteers used TreePans to finish the tree planting. 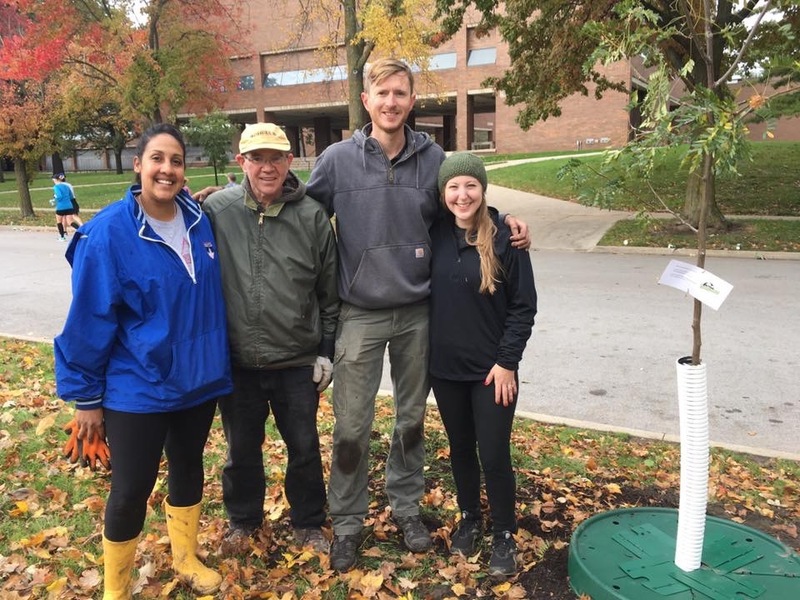 We had a great time at the Marathon Tree Planting and are thankful for the City of Des Moines and urban forestry manager Shane McQuillan for their use of our product to better water, protect, and establish these trees! Below you can see some of the thousands of runners who showed up to participate in the IMT Des Moines Marathon. We are thankful for all those who volunteered to plant trees, shade their neighborhoods, and provide oxygen for all the runners! How do you plant .2 of a tree? We got this question a lot when we were telling people what we were up to while we were bundled up, shovels in hand, digging big holes along the marathon route early Sunday morning. Well, it was a little bit of false advertising… We didn’t plant one fifth of a tree, that would be monstrous. Instead we planting 26 larger 2″ caliper trees and one sampling, less than 1″ in diameter. What the heck are those green things? Those are TreePans; better means to water, protect, and establish you trees! Why along the marathon route? We had literally thousands of community members and runners from all across the state and farther come to run by our trees! The best part… we had hundreds of shout out, high five, take pictures, and thank us for what we were doing. You can see more photos and videos from the event here!